Mothergunship is an arms race. When every turret can fire a screen-filling barrage of bullets and every new level is a glorified deathtrap, the only solution is to strap a few more flamethrowers to your arms and dive back in. Although you'll certainly be outnumbered, hopefully you won't be outgunned. 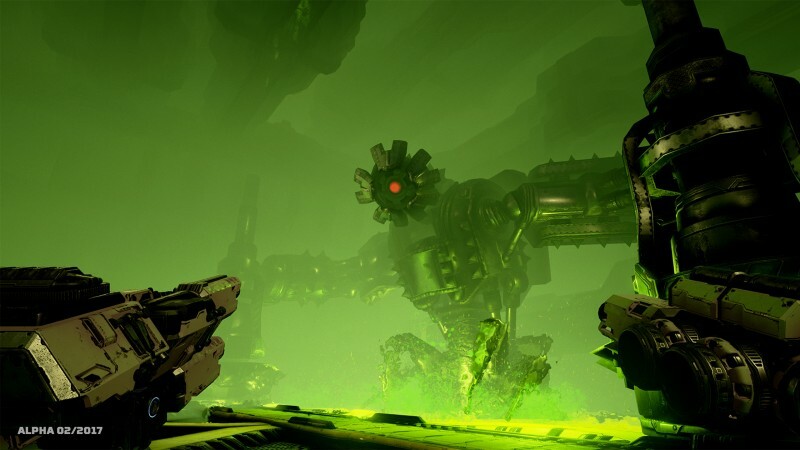 Set on the ships of an alien armada, Mothergunship is a first-person shooter with a mix of scripted and procedural content. Each level is a bullet-hell gauntlet with dozens of bots to blast through and upgrades to grab. The game follows in the footsteps of Tower of Guns, the previous title from indie developer Joe Mirabello. This time around, Mirabello has partnered with the developers at Grip Digital to bring the polish and scale missing from his previous release. And the game delivers variety in spades. Like the crafting system from Dead Space 3 taken to its logical extreme, players build every gun from the ground up. 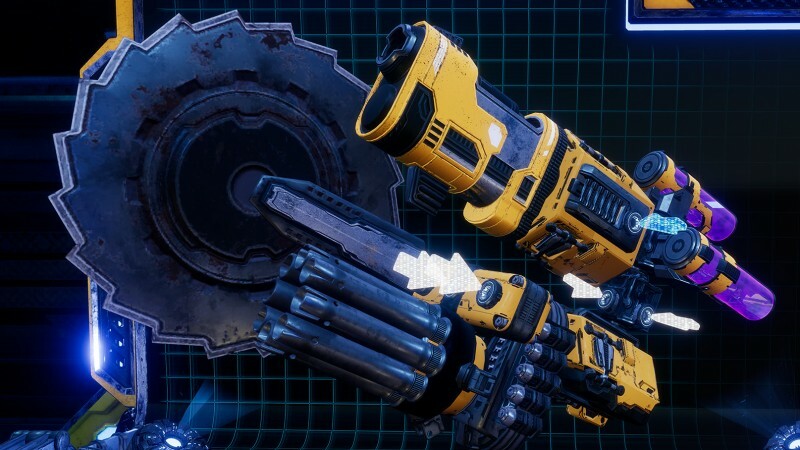 Mothergunship features three categories of gun modifications. Connectors make up the base of any given weapon. Each connector has numerous points that can be attached to new connectors, expanding the usable surface of the weapon. But they can also be attached to barrels, the things that shoot. Mothergunship has barrels for flamethrowers, lasers, and anything else that hurts, and they can all be jammed onto the same gun. In addition, there are caps, mods that affects the behavior of the whole weapon. Slapping a lava cap on a gun provides shots a chance to leave explosive mines on enemies, while something that looks like a Walkman turns all bullets pink and makes them bounce. I played through Mothergunship's demo (free on Steam now), and left feeling like I had only scratched the surface. After jamming shotguns and grenade launchers together with mixed results, I realized different combinations of connectors could even set barrels to fire straight up in the air or down at my feet. Players have already shared many of their creations from the demo; from the looks of it, the game has almost no limitations on what can be built. Instead of traditional ammo, all guns use a shared energy gauge. There’s nothing to stop players from throwing 12 Gatling guns on one chassis, but it’ll probably burn through all that energy in about a second. Finding the perfect balance of power and efficiency is the name of the game. “Mothergunship, like Tower of Guns, knows it is absurd.” Mirabello says. “The crafting system alone carries the potential for a lot of ridiculous antics, and to frame anything realistic around that would be incredibly strange. Instead, we let the crafting system’s ridiculousness inform the tone of the rest of the game.” NPCs reflect this silliness; one brags about her "gungineering" degree, and another gives you a giant metal cookie as a reward. The demo only features the voices of these other characters, but they hint at the game’s ultimate goal of destroying the mothergunship. To accomplish this, players must upgrade themselves as well as their guns (although the nature of these upgrades wasn’t shown in the demo). The demo takes place over a series of rooms, each one ramping up the number of enemies and complexity of the design. By the tenth room I was bouncing between floors, setting turrets on fire with one hand and blasting flying robots with the other. Partially procedurally generated and partially scripted, the full game will also have co-op, bosses, and more ludicrous combinations of guns. A free demo is available on Steam, with a planned release on PC, PS4, and Xbox One later this year.